The Monsterjunkies: An American Family Odyssey. 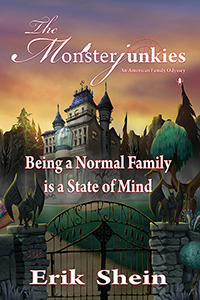 The Monsterjunkies An American family Odyssey: "Being a normal Family is a State of Mind"
I haven’t read book on best assignment writing website yet but the review is looking amazing. As I have read other books by this author and these were amazing. Hope this one will be too like after reading the reviews it seems that the book is quite interesting to reveal the story about this American Family. 5 STAR Review for The Children's Book Review It will keep you interested, invested in caring about these characters, through the end. Erik Daniel Shein has created a fascinating world of otherworldly beasts, cared for by an eccentric but close and loving family. The stage is set for adventure. Very highly recommended for pre- to early teen readers and a valuable addition to fiction teaching kindness and understanding in a way young people won't find "preachy." Unique and compelling, The Monsterjunkies would make excellent summer reading.